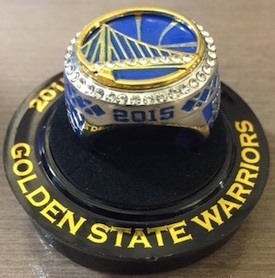 Continuing a trend from pro teams to reward supporters following a title season or in honor of a title anniversary, the reigning-champion Golden State Warriors treated their fan base to replica 2015 championship rings at the November 4 game against the Los Angeles Clippers. The rings pay homage to their win over LeBron James and the Cleveland Cavaliers in the 2014-15 NBA Finals. 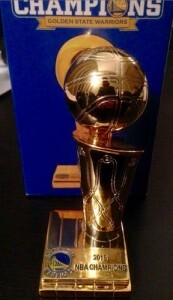 Shop for Golden Warriors SGA Replica Championship Rings on eBay. Led by budding superstar Steph Curry, the team is already off to a fast start in 2015-16, giving fans plenty to celebrate. Because of the early success this year and previous title, this game giveaway is more like icing on the cake. Limited to the first 10,000 fans, interest for the keepsake has been strong. Early prices on eBay were in the $170 to $200 range and have largely held that value. 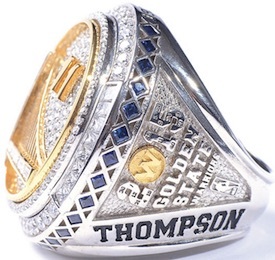 Although the replica rings appear to be nice, it is not a surprise they don't come close to matching the extravagance that is the actual team-issued title rings. 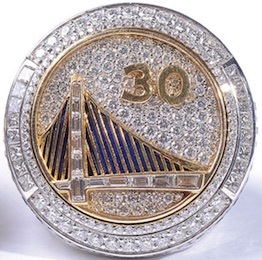 The Warriors received their rings at the opening-night game on October 27 game against the New Orleans Pelicans. Featuring more than six carats of diamonds and sapphires, there are also many cool attributes in the design that directly deal with the team and its history. The celebration does not end with the rings as the team issued a mini Larry O'Brien Trophy at their game on 11/20/2015 versus the Chicago Bulls. This giveaway was also limited to the first 10,000 fans. While they are not as popular as the rings, the quality look of the trophies and obvious significance has made them a hot seller as well. Prices online have been around $100 for the trophy giveaway piece and some sellers are pairing the replica title ring and trophy into one listing, which may end up being the best value for fans and collectors. 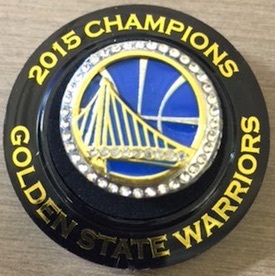 Those looking for something a good bit nicer than the giveaway replica rings can check out the team store for the Warriors. Rings honoring the 2015 title are available from Jason of Beverly Hills, the same company that produced the team-issued rings.